This is what I fondly refer to as a "weeknight curry." Wayne calls it "refrigerator curry" because whatever's in the fridge goes into the pot. I make these curries throughout the year, but I made a note of this particular one because of the way the flavors and textures worked together. 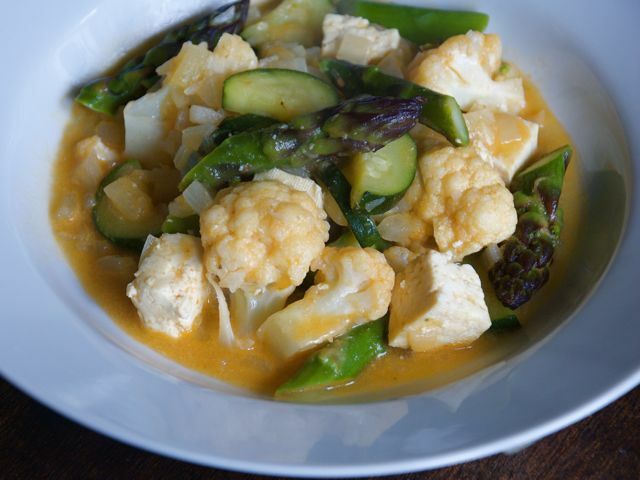 A bit of crunch from the cauliflower, color from the zucchini and asparagus, and spicy flair from the Thai curry paste made this one a late-spring favorite. I happen to use asparagus, cauliflower, and squash here, but you might trade them in for peas, broccoli, and/or tiny cooked potatoes. It's an unbelievably flexible recipe, and a great way to use up any stragglers from the weekend market or CSA delivery. If you don't like tofu, leave it out, or substitute something you prefer. Heat the coconut oil in a large pot over medium heat. Stir in the onion and zucchini and a big pinch of salt. Sauté until the onion starts to become translucent and cook for 1 minute more. In the meantime, in a small bowl, mash the curry paste with a few tablespoons of the coconut milk. Add this to the pot and stir until the onions and zucchini are well coated. Stir in the remaining coconut milk. Bring it to a simmer, then add the tofu, cauliflower, and asparagus. Cover and cook just long enough for the tofu to heat through and the asparagus and cauliflower to lose its raw edge, a couple of minutes. Uncover and add the broth. Stir and taste. Now here's the crucial part: You need to salt appropriately. If your broth was salty, you will need less than if you used a less-salty broth. Add a little at a time until the flavors in the curry really pop. Culinate editor's note: This is a great curry recipe/formula to have in your cooking repertoire. Because I like cauliflower more cooked than raw, I add it first and let it cook for a few minutes, then add the tofu and asparagus. I also add a bit more broth, because I like my curry a little brothy.